7 Ways to Be a Marketing Genius. Truthfully, it’s not difficult to do a decent job of marketing. But why settle for average when you can really shine? These tips are designed to propel you into marketing genius territory. If this sounds more like marketing 101 than marketing genius material to you, then think again. Considering your goals is a basic thing, it’s true, but one that many marketers overlook, and they end up struggling as a result. Before you can find success in marketing a company or product, you have to take the time to consider and then clearly lay out and articulate your goals. The more specific, the better! For instance, a goal of “increase business by 30% by the end of the fourth quarter” is a far better and more workable goal than “increase business” or “make money”. A specific goal gives you something specific to work toward, giving you a focal point for your marketing efforts. Everything that you do, from creating custom signage to trade show swag, should be made with consideration of these goals in mind. Will this take you closer to your goals? How? By asking questions, you’re better positioned to come up with great solutions with your marketing. And that’s pure genius! Instead of trying to think about what your customers want, shift your thinking to that of a consumer. This may be easier to do if you think outside of your company or product offerings for a moment. Think about a product or service that you might need. Now, think about how you would approach finding that service. Would you drive around town? Would you call a friend for advice? Or would you hit the web and see what services or products are available? Chances are, there are others who think similarly. Try to anticipate how and where customers will try to find your product or service, and try to insert yourself in as many of those places as possible. Develop a web presence, and back it up with easily visible branding that people can see: perhaps vehicle printing on your car or a company vehicle, or placing a printed boulevard banner near your place of business. One of the easiest and most popular modes of marketing is to offer functional branded items as a promotional item. By offering customers a useful item that can be employed in daily life, be it while in movement or in their home, they will be exposed to your branding over and over. This infusion through repetition makes them think of you first when they are in need of relevant products or services. There are all sorts of branded marketing items which you can produce inexpensively and give out to customers, either at events or trade shows, or as a gift with purchase. It might be a small item like branded sunglasses, a useful item such as a mouse pad, a functional and handy item such as a beverage carrier, or any number of promotional aids. Marketing covers a huge number of different methods of promoting your business and making your mark on potential and existing customers. Effective marketing is memorable and grabs the attention of your desired audience. So how could you be memorable in your marketing? Often, creating memorable marketing materials is the beautiful fusion of two things: beautiful imagery and eye-catching customized promotional items. The first step, of course, is working to create your brand identity. This means creating a logo, company colors, and highly recognizable and identifiable imagery which is associated with your company. Then, you figure out a canvas for your beautiful imagery. Creating large-scale printed signage is a great way to make your business stand out in people’s minds. For instance, a printed decal on windows or a large banner will command attention and remain tattooed in people’s memories. Beautiful graphics and large-scale signage are amazing, but sometimes you need to make a splash. By thinking outside of the box when it comes to your marketing materials, you can make a great impression on customers. This is where creative branded products come into play. 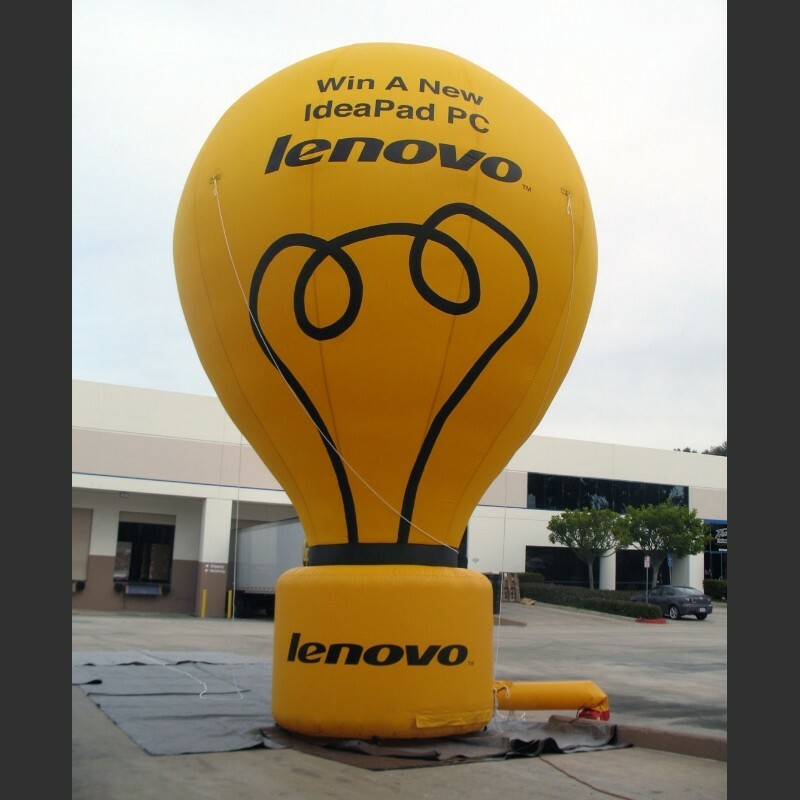 Advertising inflatables, for instance, always have an impact. Available in sizes that are appropriate for a tabletop to large-scale, parade-worthy specimens, these will always command attention. However, inflatables aren’t the only way to make a big impression. Above All Advertising has plenty of creative advertising materials, from customized changing rooms to branded games, that will suit a number of needs and company styles. Marketing is lonely without friends. On the one hand you’re engaging with your customers and target audience...but you could double (or more!) your reach by forging a smart partnership. Market umbrellas provide a great example. If you don’t have a retail storefront, you don’t have the option to place an A-frame board or a hanging banner right outside of your door. However, if you sponsor branded umbrellas to be displayed at a crowded restaurant, you’ll have a captive audience from dinner service to last call who can discover you in a low-key way. 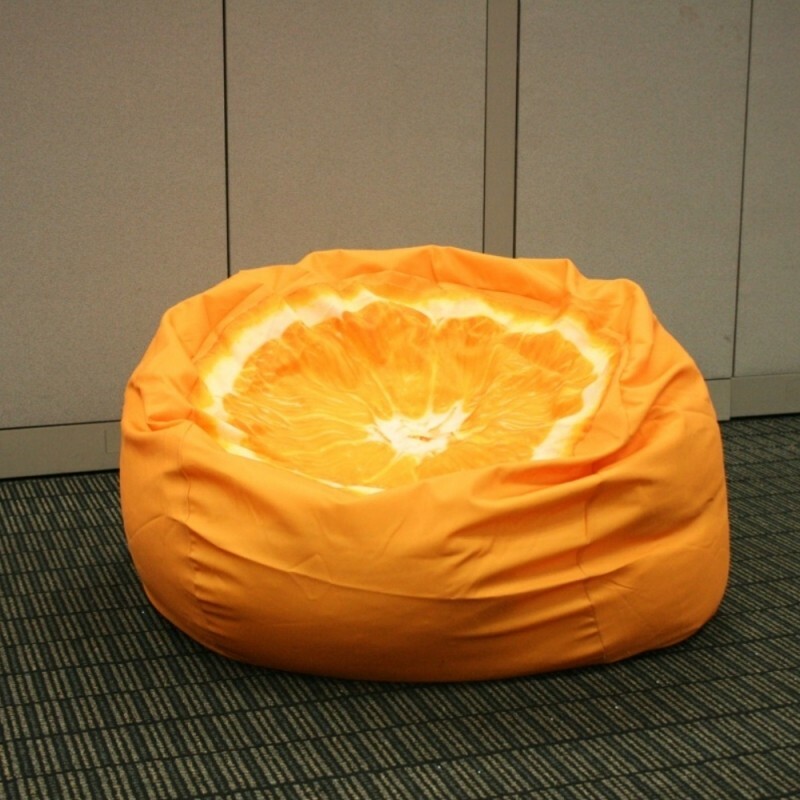 Branded furniture, such as the branded beanbag pictured above, provides another great opportunity for partnership. Say you have a retail store in a large, hard-to-navigate mall. You could provide branded furniture for a common area in the shopping center, which could increase your audience and lure customers to your space. This is the type of marketing that makes you memorable, and creatively insinuates your brand into the world! Create a world with your branding. To really take your marketing to the next level, you’ve got to think big. Begin to consider your branding as much larger than just a logo and a look. Think of your branding as an opportunity to create a world for your company. Then, think of your marketing efforts as a mode of inviting customers into this world that you’ve created. Disney World is a perfect example of a branded world. No, you don’t have to create a theme park to create a world with your brand, but do think about how you could create a full-bodied experience of your company and culture with your advertising materials. By creating a suite of branded items including signs, promotional aids, and engaging items like branded games which all have your signature look and style, you are in fact creating your own world. It creates a company culture which is easily recognizable to potential customers. By doing this, you’ll create a sanctuary from which to sell to others! Conclusion: Sometimes, genius lies in simplicity. To really be a marketing genius, it’s a matter of taking the time to look at the simplest aspects of marketing and truly hone them to suit your company’s goals. By following the tips detailed in this post, you’ll be well on your way to creating a truly memorable marketing campaign and increasing business in a big way. What’s your favorite mode of marketing?